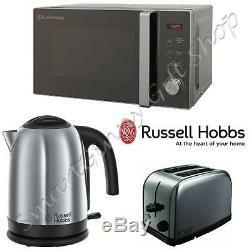 Russell Hobbs Silver 20L Microwave Kettle 2 Slice Toaster Kitchen Appliance Set. Looking for a matching colour microwave, kettle toaster set or other matching colour appliances for your kitchen? You're in right place, we're also creating custom appliances sets for your requirements. And we'll answer you within 2 hours or choose colour or style below to see our full range of microwave kettle & toaster sets or other coloured kitchen appliance sets. Russell Hobbs RHM2076S 20L Silver Digital Microwave. The Russell Hobbs RHM2076 is a super stylish silver microwave, with an attractive mirror door finish. It comes with a handy digital clock and pre-set function, allowing you keep track of the time & know exactly when your food will be ready. This attractive appliance also has impressive functionality with 800 watts of microwave power, providing quick and convenient cooking in your home. For peace of mind about safety, the RHM2076 comes with a child safety lock option preventing young children from being able to open the microwave door. The Russell Hobbs RHM2076 has a 20 litre cavity capacity, which comfortably fits a standard dinner plate and the glass turn-table is removable for easy cleaning, and is also dishwasher safe. Additional features of the RHM2076 Russell Hobbs microwave include pre-programmed auto cook menus such as pizza, fish & popcorn, allowing you to cook all your favourite food at the push of a button. With 5 microwave power levels to choose from, you can ensure all your food is cooked to the perfect temperature. Russell Hobbs 20070 Cambridge Kettle, 1.7 L, 3000 W - Brushed Stainless Steel Silver. Brushed stainless steel kettle with plastic accents. Russell Hobbs 18780 Futura 2 Slice Toaster - Stainless Steel Silver. Brushed and polished stainless steel. ALL ITEMS SENT DIRECTLY FROM APPROVED 3rd PARTY SUPPLIERS. These items may be dispatched directly to you from a third party distributor. You must have a confirmed address. This allows our products to remain very competitively priced. Please note, bundled items may arrive separately and on different days because we may use different suppliers. We may also re-use packaging when appropriate as an attempt to reduce our overall environmental impact on the planet. Please note that any pre-existing damage of the received item/s MUST be communicated within 24 hours after the item has been received; failure to do so may result in us (on our supplier's behalf) not granting you the return. When returning an item, it must be in all of the original packaging and include all of the original accessories or items that came with it. The item and package should be in original and perfect condition. We do our best to process as quickly as possible. We request you to try your new item/s as soon as you receive them. If the item in your opinion doesn't correspond to pictures and/or descriptions, you MUST inform us within 24 hours after the item has been received; failure to do so may result in us (on our supplier's behalf) not granting you the return. If you changed your mind about the item, but nothing is wrong with the item itself e. It works properly and perfectly corresponds to pictures and descriptions, we (on our supplier's behalf) may not grant you the return. The item "Russell Hobbs Silver 20L Microwave Kettle 2 Slice Toaster Kitchen Appliance Set" is in sale since Tuesday, February 7, 2017. This item is in the category "Home, Furniture & DIY\Appliances\Coffee, Tea & Espresso Making\Kettle & Toaster Sets". The seller is "*microwave-kettle-toaster-sets*" and is located in London.